More than 64,000 people attended the 2016 SHOT Show in Las Vegas Jan 19-22 making it the second highest attendance in the show’s history. Exhibitors numbered 1,600 filling 13 acres of product displays. The strong showing demonstrates that the shooting sports industry is strong and healthy. “We are ecstatic at the response to this year’s show,” Chris Dolnack, National Shooting Sports Foundation senior vice president and chief marketing officer said in a press release. 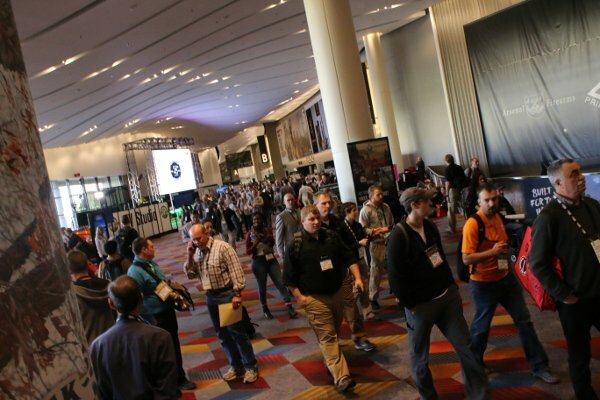 Among the new features at this year’s industry trade show were SHOT Show TV, which aired in more than 70,000 hotel rooms, a new NSSF members reception and the SHOT Show NEXT Pavilion. This marked several milestones for American gun manufacturers including the 200th anniversary for Remington and the 150th birthday for Winchester Repeating Arms. Thomas O’Keefe, president of Winchester Ammunition, said the show went perfectly. Sig Sauer Vice President Tom Taylor said the company’s investment in their booth paid off. “We made a huge investment in the booth because we want our customers to know that we are a total system provider,” Taylor said in the release. At the industry dinner on the first night, Steve Sanetti talked about the role the NSSF plays in gun safety with programs such as Project ChildSafe, FixNICS and Don’t Lie for the Other Guy. “Much of the public and the media are woefully misinformed about who we are and all that we do about genuine gun safety,” said Sanetti. “We have to face the fact that our industry is being blamed, and attacked and pilloried unfairly by politicians, media and agenda-driven social engineers seeking a convenient scapegoat for the result of policies which, ironically, they themselves have championed,” said Sanetti. For additional SHOT Show coverage by LiveOutdoors including video and reveiws, visit our main show page here.